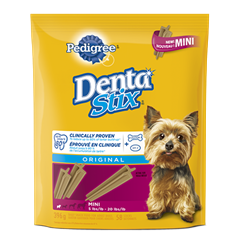 Medium Dog Denta Stix® treats are designed for dogs between 22 - 55 lbs and are a clinically proven, easy way to help reduce up to 80% of tartar build-up. 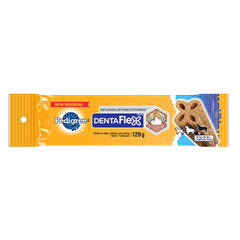 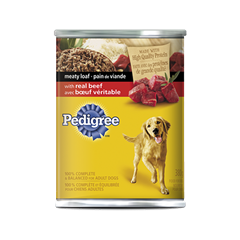 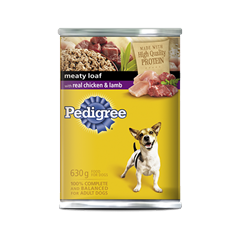 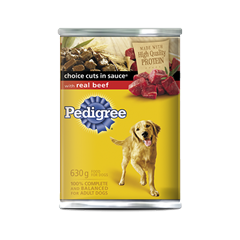 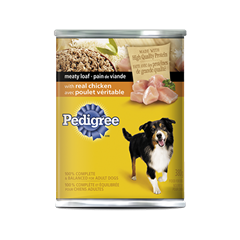 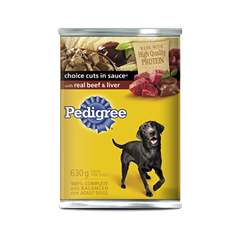 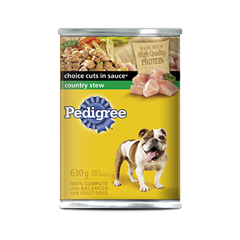 PEDIGREE® DentaStix® Daily Oral Care for Medium Dogs - Beef Flavour is rated 4.7 out of 5 by 54. 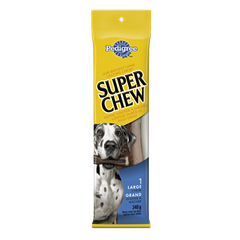 Rated 5 out of 5 by CAROLYNBON_3291021636 from I have 2 dogs (14 yrs 5 yrs) they both enjoy these Dentastix. 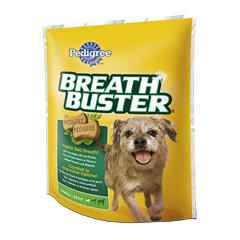 I was concerned with my senior dog whether this product would be too strong for her gums/teeth but it isn't. 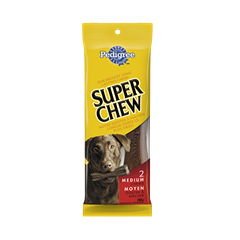 I will continue buying this product as my dogs love this Treat and its a great product for them. 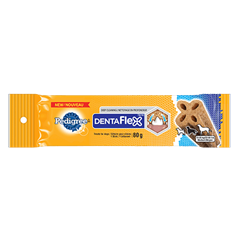 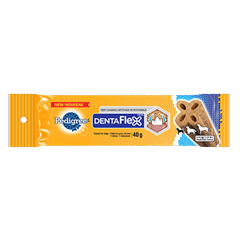 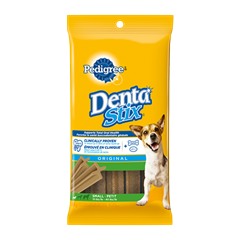 Rated 5 out of 5 by COLLEENCON_329999605 from My dog Russel loved the Denta Stix! 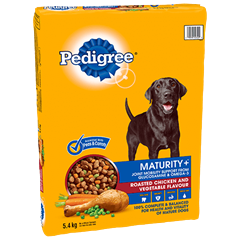 All we have to do now is show him the package and her runs around in circles with his tail wagging! 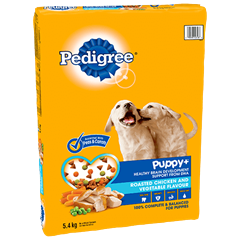 Make sure to follow the feeding directions on the package, as it is tempting to keep feeding them to your pet. 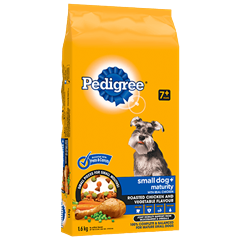 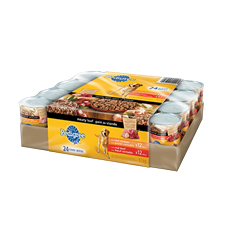 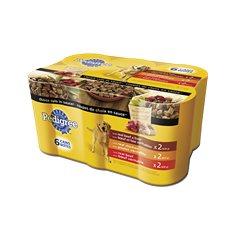 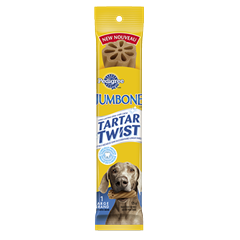 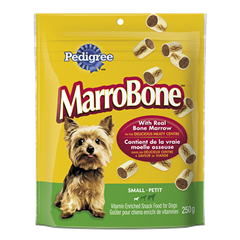 Rated 5 out of 5 by THERESACQC_329868792 from This product is amazing, as soon as I opened the package my dog MAX begged for it and now everyday he goes to the place that I hide them and sits there until I give him his treat. 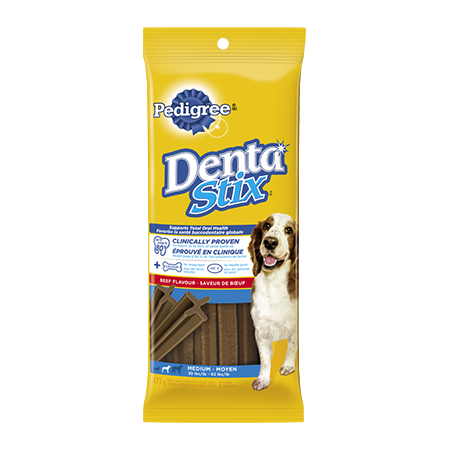 Thanks Pedigree your Dentastix are a complete success with my dog. 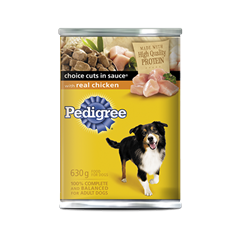 Rated 5 out of 5 by NanC from Like the product My dog is over 10years old and has had a dentastix every morning he sits and waits at the cupboard where they are stored until he gets it. 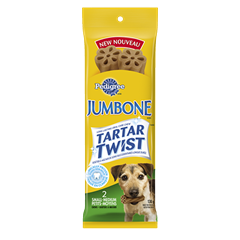 After ten years he is finally starting to show some tartar build up. 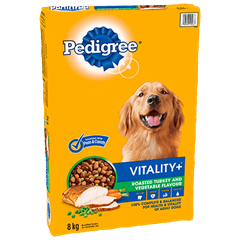 I think they are an excellent product. Rated 4 out of 5 by LEANNASON_3291017041 from My pet liked his Dentastix very much. 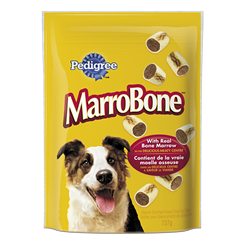 They were very appealing to him and he ate the whole thing. 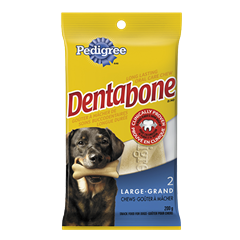 I'm not sure however if it reduced his buildup or made his teeth stronger. 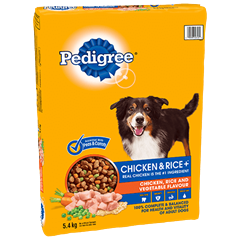 I would maybe like to see a chicken/veg flavor option, if possible. 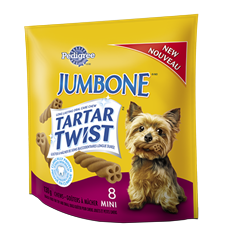 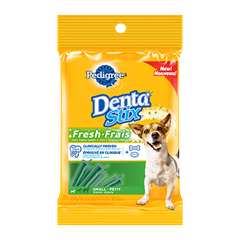 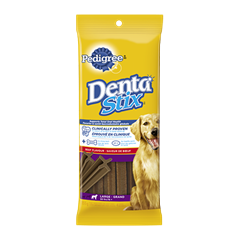 Rated 5 out of 5 by MELANY_SNB_3291025243 from Our 90 lbs dog liked those Dentastix very much. 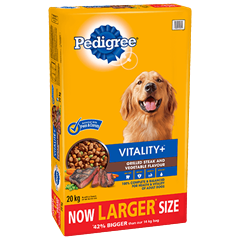 The medium size was perfect for a small snack for him, without giving too much. 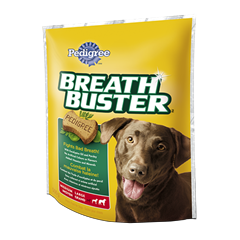 He definatly recognized the sound of the packaging! 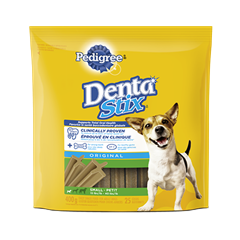 I will buy this again for my furry baby! 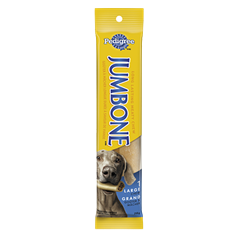 Rated 4 out of 5 by VANESSABBC_329880037 from My dog really enjoyed this bone. 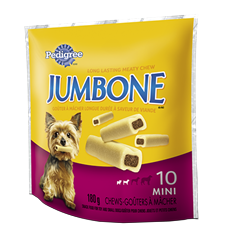 However they were a little too big in size for her and I had to rip the bone up. 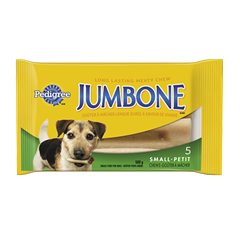 It was a tough bone to make into small pieces. 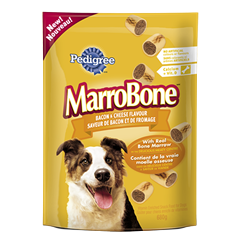 My doggy still loved the flavour and enjoyed the bone! 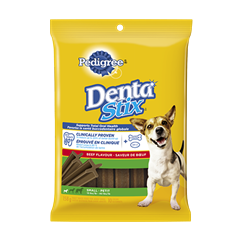 Adult Dogs: 1 stick per day. 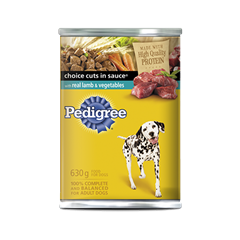 Not suitable for dogs under 10 kg or 22 lb. 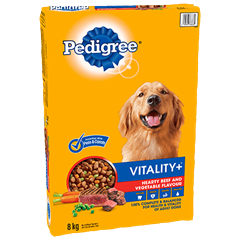 RICE FLOUR, WHEAT STARCH, GLYCERIN, GELATIN, GUM ARABIC, CALCIUM CARBONATE, NATURAL POULTRY FLAVOUR, CELLULOSE POWDER, SODIUM TRIPOLYPHOSPHATE, SALT (IODIZED), POTASSIUM CHLORIDE, CARAMEL, VITAMINS (CHOLINE CHLORIDE, L-ASCORBYL-2-POLYPHOSPHATE [SOURCE OF VITAMIN C*], d-CALCIUM PANTOTHENATE, VITAMIN B12 SUPPLEMENT, FOLIC ACID, VITAMIN A SUPPLEMENT, NIACIN, RIBOFLAVIN [VITAMIN B2], PYRIDOXINE HYDROCHLORIDE [VITAMIN B6], VITAMIN D3 SUPPLEMENT, THIAMINE MONONITRATE [VITAMIN B1], dl-ALPHA TOCOPHEROL ACETATE [SOURCE OF VITAMIN E]), NATURAL BEEF AND SMOKE FLAVOURS, POTASSIUM SORBATE (A PRESERVATIVE), ZINC SULPHATE, GREEN TEA EXTRACT, TURMERIC, IRON OXIDE, COPPER SULPHATE.